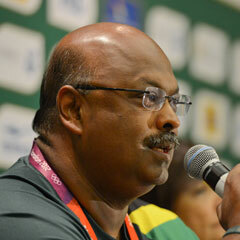 Johannesburg - South Africa's performance at the Olympic Games was the best since the end of apartheid, Sascoc chief executive Tubby Reddy said on the team's arrival in Johannesburg on Tuesday. The team won six medals, half of the goal of 12 set by the SA Sports Confederation and Olympic Committee (Sascoc). Chef de mission Patience Shikwambana said Cameron van der Burgh's gold for breaststroke had fired up the rest of the team, and she congratulated him. She called his fellow swimming medallist Chad Le Clos, "No Stress Le Clos" for his approach to beating United States swimmer Michael Phelps. While they were speaking, supporters continued singing outside the conference room. ANC MP Winnie Madikizela-Mandela and Sports Minister Fikile Mbalula received the first of South Africa's Olympic athletes when they arrived at the OR Tambo International Airport, in Kempton Park, on Tuesday morning. Medallists, 800m runner Caster Semenya and canoeist Bridgitte Hartley stood in front of Madikizela-Mandela as supporters used their cellphones to take photographs. The crowd of supporters gathered at the airport sang the national anthem for the athletes, who stood in a line with their hands on their chests. A loud cheer, whistles and vuvuzela blasts followed. The Mahikeng local municipality erected a massive banner welcoming back marathon runner Stephen Mokoka, who came 43rd. His supporters wore specially made T-shirts, and had one mounted in an ornate gold-coloured frame. Crawford College Sandton pupils chanted school war cries when they were not singing shosholoza, and "welcome home" posters made by media houses got trampled underfoot. South Africa was the highest-placed African nation on the Games medals table, in 24th position with six medals -- three gold, two silver and one bronze. Semenya won silver in the women's 800m, and Hartley bronze in the women's kayak single K-1500m sprint. Rowers Sizwe Ndlovu, Matthew Brittain, John Smith and James Thompson won gold in the men's lightweight four. "I train with them and I know what it's like for them. It's very inspiring," he said.